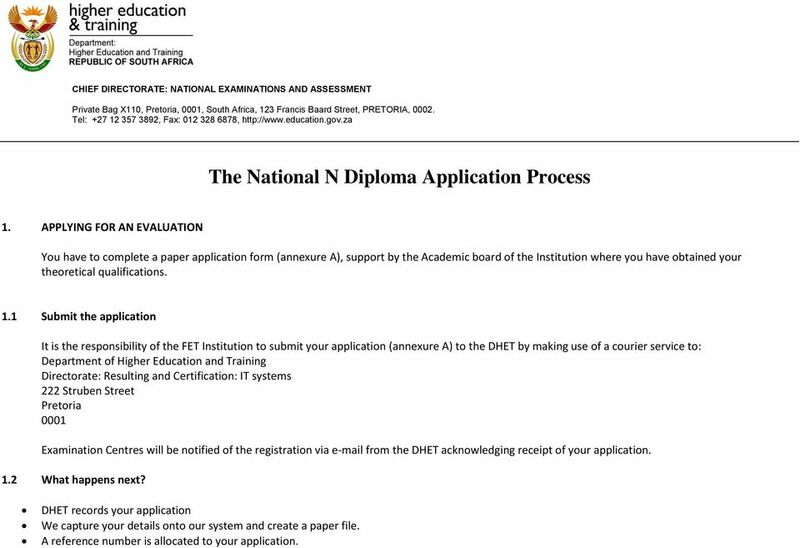 Download "The National N Diploma Application Process"
1 CHIEF DIRECTORATE: NATIONAL EXAMINATIONS AND ASSESSMENT Private Bag X110, Pretoria, 0001, South Africa, 123 Francis Baard Street, PRETORIA, Tel: , Fax: , The National N Diploma Application Process 1. APPLYING FOR AN EVALUATION You have to complete a paper application form (annexure A), support by the Academic board of the Institution where you have obtained your theoretical qualifications. 1.1 Submit the application It is the responsibility of the FET Institution to submit your application (annexure A) to the DHET by making use of a courier service to: Department of Higher Education and Training Directorate: Resulting and Certification: IT systems 222 Struben Street Pretoria 0001 Examination Centres will be notified of the registration via from the DHET acknowledging receipt of your application. 1.2 What happens next? DHET records your application We capture your details onto our system and create a paper file. A reference number is allocated to your application. 3 2. THE NATIONAL N DIPLOMA This qualification is aimed primarily at giving the learner technical, theoretical knowledge, practical knowledge and workplace knowledge and skills required in their chosen occupational/vocational area. 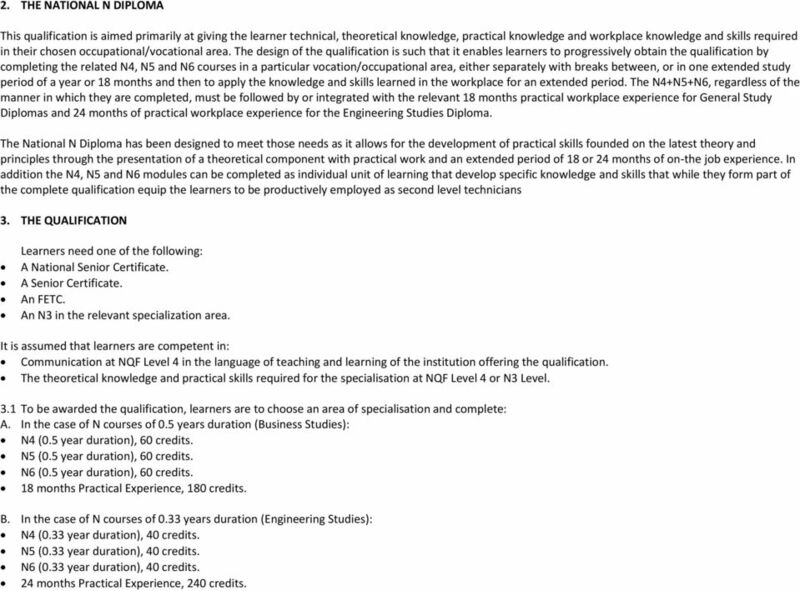 The design of the qualification is such that it enables learners to progressively obtain the qualification by completing the related N4, N5 and N6 courses in a particular vocation/occupational area, either separately with breaks between, or in one extended study period of a year or 18 months and then to apply the knowledge and skills learned in the workplace for an extended period. The N4+N5+N6, regardless of the manner in which they are completed, must be followed by or integrated with the relevant 18 months practical workplace experience for General Study Diplomas and 24 months of practical workplace experience for the Engineering Studies Diploma. The National N Diploma has been designed to meet those needs as it allows for the development of practical skills founded on the latest theory and principles through the presentation of a theoretical component with practical work and an extended period of 18 or 24 months of on-the job experience. In addition the N4, N5 and N6 modules can be completed as individual unit of learning that develop specific knowledge and skills that while they form part of the complete qualification equip the learners to be productively employed as second level technicians 3. 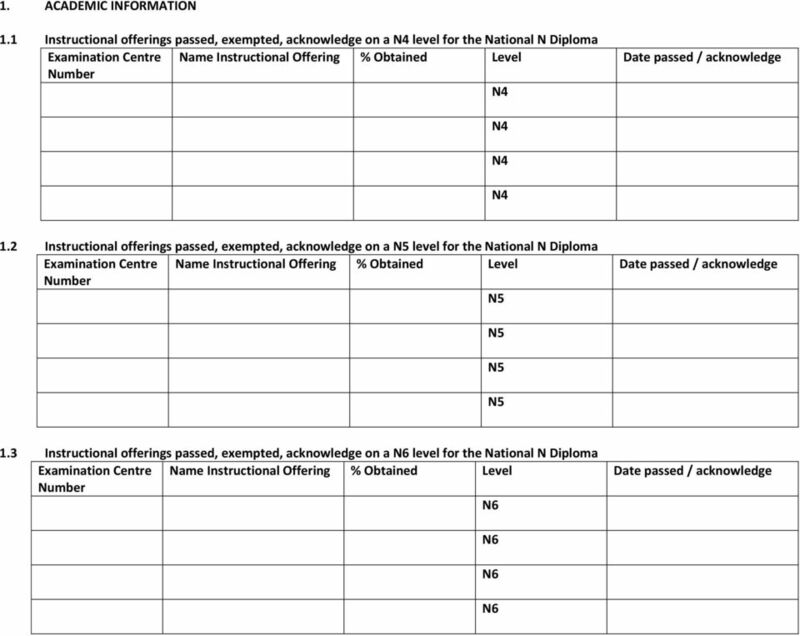 THE QUALIFICATION Learners need one of the following: A National Senior Certificate. A Senior Certificate. An FETC. An N3 in the relevant specialization area. 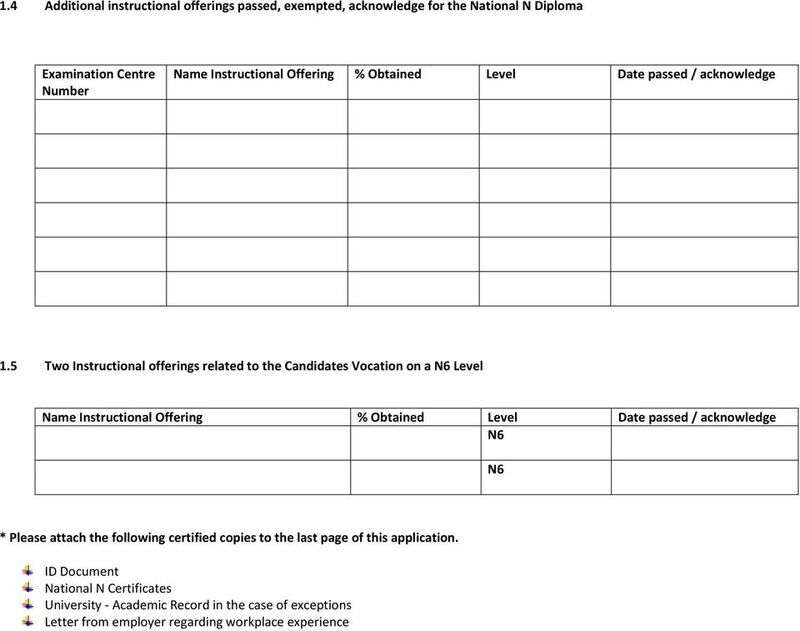 It is assumed that learners are competent in: Communication at NQF Level 4 in the language of teaching and learning of the institution offering the qualification. The theoretical knowledge and practical skills required for the specialisation at NQF Level 4 or N3 Level. 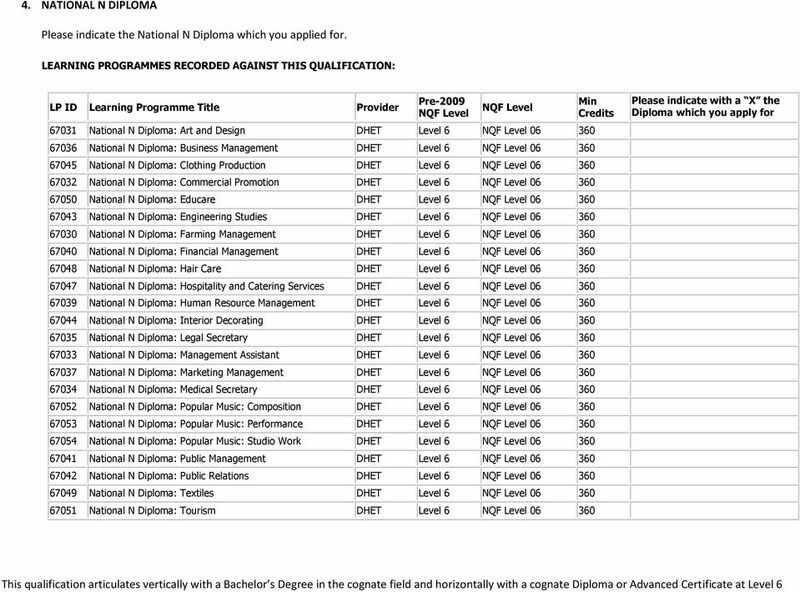 3.1 To be awarded the qualification, learners are to choose an area of specialisation and complete: A. In the case of N courses of 0.5 years duration (Business Studies): N4 (0.5 year duration), 60 credits. N5 (0.5 year duration), 60 credits. N6 (0.5 year duration), 60 credits. 18 months Practical Experience, 180 credits. B. 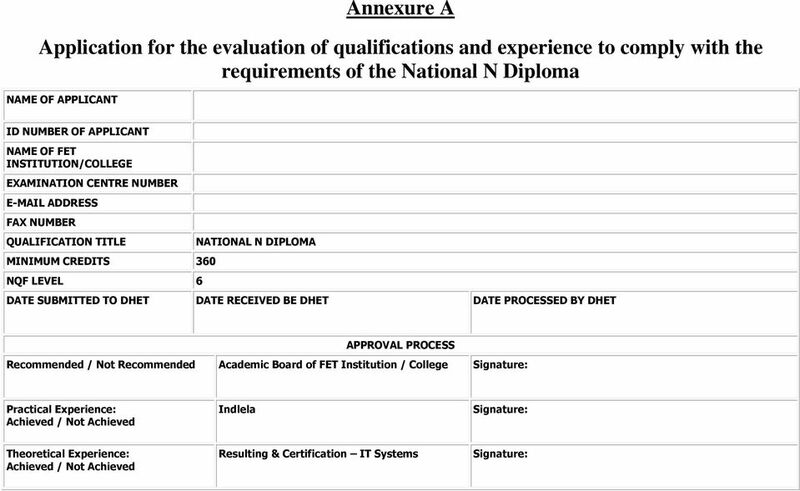 In the case of N courses of 0.33 years duration (Engineering Studies): N4 (0.33 year duration), 40 credits. N5 (0.33 year duration), 40 credits. N6 (0.33 year duration), 40 credits. 24 months Practical Experience, 240 credits. 7 5. LEGISLATIVE MANDATE National Policy Relating to the Examinations of Formal Technical College Instructional Programmes as promulgated in Government Gazette No of 26 October 2001; National Education Policy, Formal Technical College Instructional Programmes in the RSA, Report 191 (2001/08), Part 2: N4 to N6; and National Education Policy, Norms and Standards for the Instructional Programmes and the Examination and Certification thereof in Technical College Education, Report 190 (2000/03). NATIONAL CERTIFICATE: MANAGEMENT NQF LEVEL 3 SAQA- ID 83946 Qualification Outcome Qualifying learners should be capable of: Co- ordinating with others. Making significant choices from a wide range of procedures. Meriting Youth Development and Imsimbi Training proudly presents Business Administration Services Further Education and Training Certificate (FETC) SAQA ID 61595 (L.P. 35928) NQF L4 worth 140 Credits. 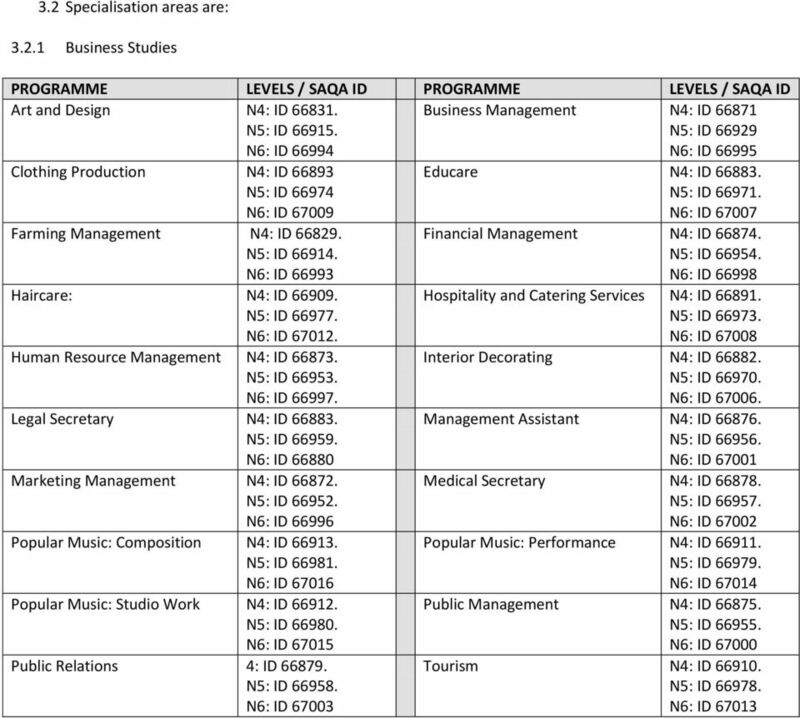 Faculty of Department of industrial psychology and People Our Honours Qualifications Content Page 1. Who are we? 1 2. What is our total offering? 2 3. What is the profile of the graduates we aim to deliver? Our programmes seek to offer: >> INDUSTRY SUPPORT Create a body of knowledge for the collective benefit of all stakeholders in the industry. AVOID THE DETOURS A vital contributor to the success and profitability of many organisations, from farming, to manufacturing, to mining has been Logistics and Supply Chain Management skills and services. 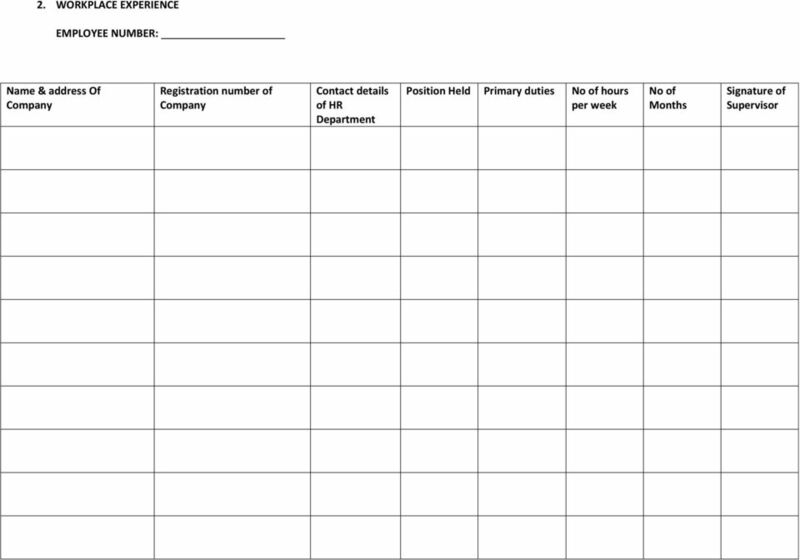 Identify the category that is applicable to you and complete only those sections of the form as indicated in the table below. Quality Assurance Framework Draft Policy for the Quality Council for Trades and Occupations Department of Labour First Version 26.07. 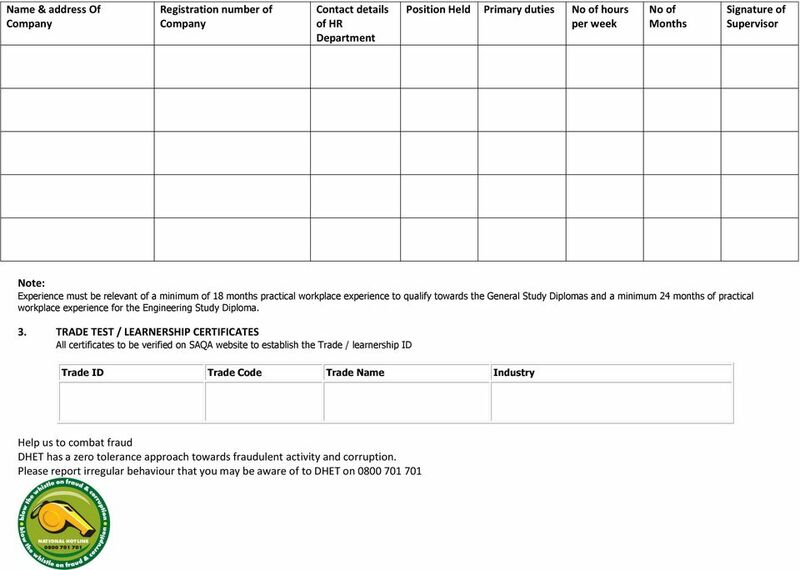 ETQA ADMINISTRATOR Salary: R175 266. 84 per annum (All Inclusive Package) ETQA Administrator. The successful applicant will be based in Pseta offices in Hatfield, Pretoria and will report to the ETQA Manager. APPROVED INSPECTION AUTHORITIES: OCCUPATIONAL HYGIENE.